In the Pacific Rim area you'll find hard-sand beaches, green gems of islets offshore, and behind and around it all a great rain forest laced with hiking trails and clear streams. The Alberni Valley, Bamfield, Ucluelet, Tofino, Port Alberni, and the Pacific Rim National Park, including Long Beach, the Broken Group Islands and the West Coast trail are all here. Offshore, there are whales, shipwrecks and lofty underwater pinnacles. It comes over you quietly, like sunshine on a cloudy day. Suddenly, you're aware that, whatever you're doing, you have not thought of anything else for some time. You are immersed in this moment. It's what we all seek when we go on vacation, of course escape from the old day-by-day existence, even for a little while. And for those who have discovered the Pacific Rim, it's what makes this area special. Others will talk about wild Pacific ocean waves lashing a rugged shoreline, about pods of whales surfacing just yards from your boat, or about catching a salmon that took 45 minutes to reel in. 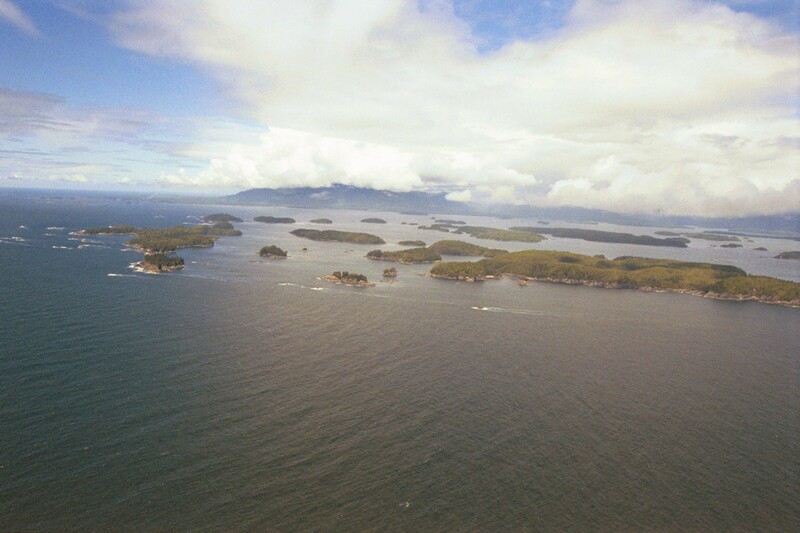 They'll say the diving in Barkley Sound is unpopulated and unbelievable, and the West Coast Trail is a scenic marvel. They'll talk about quaint lost-in-time villages that make you think of rain slickers and dories floating on a bed of fog. Or endless beaches of fine, white sand that darken here and there with the shadows of soaring eagles. But you don't have to listen to them. All you have to do is come, and you'll have all that. And more. It's simple, really. The Pacific Rim is a world in itself, a place close to the major centers of Western Canada and the United States, yet sealed off from all that commotion by rugged mountains and wild ocean. There's plenty to do here - there are festivals, wonderful little shops and tasty restaurants, organized activities like whale-watching. But the Pacific Rim is still largely waiting to be discovered by tourists, so come on out - you'll beat the crowd. And you'll be sitting in a canoe, watching black bears forage on the shore, when it happens. Or lounging in a hot tub while the sky turns fierce with a blooming winter storm. Or strolling silently up a moss-soft trail. Suddenly you'll realize that you haven't thought of a single thing but what you're doing in ... well, quite a while. So come to the Pacific Rim. Immerse yourself, and wait for the unexpected. Catch Highway 4 at Parksville/Qualicum Beach, and you'll reach Port Alberni first, then Long Beach, where you can turn north for Tofino, or south for Ucluelet. You can take a ferry at Port Alberni, down the Alberni inlet to Ucluelet and Bamfield. You can reach Bamfield by unpaved road from Port Alberni and from the Cowichan region on the southeast coast. There are flights from Vancouver and Seattle, and boats from Port Renfrew. No matter how you cut it, it's a great trip - and an incredible destination.